Available in single power models: 5Kw, 30Kw, 60Kw, 75Kw, and 100Kw. The Model IV-75 power unit is used in a wide range of industries and applications worldwide. The unattended continuous operation requires little maintenance. The completely self-contained cabinet may be remotely located from the microwave applicator. The power generator has dual doors for maximum accessibility. 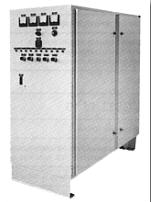 The magnetron is operated and protected by circuit functions designed for automatic and manual operation. Power Output: All Models are continuously adjustable from 0 to full power. Stability of the output power is achieved by a closed loop feed back system that monitors the anode current of the industrial magnetron. Power Control: The generator’s output power is controlled by an Alen Bradley 5/03 PLC. 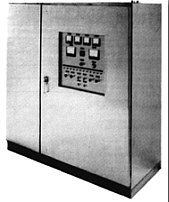 System Monitoring: The Model IV-75 is designed to allow the operator to monitor all functions via analog meters located on the control panel. The metering consists of output power, reflected power, anode voltage, and anode and filament current. In addition, the status of all protection interlocks for the safe and reliable operation of the generator is displayed on the control panel. Magnetron Protection: A three port ferrite circulator is built into the equipment to prevent damage to the magnetron during high reflected power periods. In addition, the generators are equipped with a directional coupler circuit which monitors the reflected power and de-energizes the high voltage to the magnetron should the levels become too high. Arc Detection: Also standard is an arc detection system which protects the magnetron, three port circulator, and waveguide from damage should arcing occur by de-energizing the high voltage to the magnetron. Magnetron Protection: A circulator and termination are provided to isolate the magnetron from the applicator load variations. Applicators: Model IV-6 can be used with various applicators such as: multi-mode cavities, slotted wave guides and specialized structures with the proper applications.